What is the T.E.A.L.Walk™/ Run Race Event™ Program? Show your support for ovarian cancer awareness T.E.A.L.Walk™ by participating in a T.E.A.L.Walk™ or T.E.A.L. Run Race Event™. The T.E.A.L.Walk™/Run Race Event™ Program includes Walk and Run events in various cities in the USA. These events celebrate the courage of Ovarian Cancer survivors and the strength of the families who’ve been touched by the disease, while spreading awareness to the public and raising money for research. The name of the T.E.A.LWalk™/Run Race Event™ evokes both Teal, the color that symbolizes Ovarian Cancer, and for the not for profit organization that established the events, Tell Every Amazing Lady About Ovarian Cancer Louisa M. McGregor Ovarian Cancer Foundation. T.E.A.L.®’s premiere event, the Annual Brooklyn T.E.A.L.®Walk/Run, from which the foundation owes its inception, began in 2009. This Walk is a non-competitive 2.5 mile event with both individual walkers and teams of walkers while the Run is a friendly competition and timed 5K race event followed by an Award Ceremony where winners are announced. T.E.A.L.® has successfully launched satellite T.E.A.L.®Walks and 5K Runs, as part of a planned initiative to spread T.E.A.L.®’s mission through the T.E.A.L.®Walk nationally, to touch more people than ever before. This initiative allows T.E.A.L.® supporters and Ovarian Cancer Survivors who do not live in the Brooklyn area to attend a T.E.A.L.® Walk/Run in their area. Our Brooklyn and Satellite T.E.A.L.® Walk/Run Program makes a direct impact on our society by addressing this important women’s health issue and demonstrating the power and unity of many individual communities across the United States coming together in the larger fight against Ovarian Cancer. Over 17,035 registered participants have been a part of our T.E.A.L.® Walk/Run program with 906 teams since 2009. Check Event Central to find information about upcoming T.E.A.L.® Walks and Runs. The T.E.A.L.® Walk/Run Programs is Expanding to other states in the USA (NY, AL, GA, CT, & PA)! T.E.A.L.® had its first ever T.E.A.L.® Satellite Walk called the Woodbury T.E.A.L.® Walkwhich took place in Highland Mills, NY in 2013. A committed T.E.A.L.® volunteer, Ovarian Cancer survivor, and activist spearheaded this walk, which helped spread T.E.A.L.®’s message and impact beyond Brooklyn and raised over $6,000. The event was hosted by the Woodbury Parks and Recreations department and organized by the same T.E.A.L.® Ovarian Cancer Survivor. The event grew with almost 200 walkers and raised over $12,000. T.E.A.L.® had its first Pennsylvania T.E.A.L.® Walk spearheaded by a high school senior. The T.E.A.L.® Walk took place at the Carrol Valley Community Park in Fairfield, PA and raised over $1,000. Miss Alabama contestant Kendyl Jones used Ovarian Cancer Awareness as her platform with a 5K run in Alabama called “Un-T.E.A.L. There’s A Cure.” This 5K Run raised over $1,200 for T.E.A.L.® ‘s Ovarian Cancer research and awareness programs. Taking place at White Memorial Conservation Center in Litchfield, Connecticut, this walk raised over $2,000. Hosted by Hope Assembly #46 (International Order of the Rainbow for Girls) and organized by T.E.A.L.® volunteers. This T.E.A.L. ®Walk/Run takes place at Lake Mayer Track with great success, surpassing its original fundraising goal of $1,000. This event was possible thanks to our dedicated T.E.A.L. volunteer organizer and her collaboration with Kappa Psi-Delta Omega Fraternity at South University. Taking place at Whitestown Town Park in Whitesboro, New York. 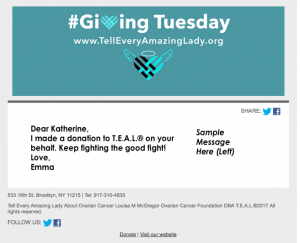 Tell Every Amazing Lady About Ovarian Cancer Louisa M. McGregor Ovarian Cancer Foundation is a not for profit 501 (c)(3) organization started by the late Louisa M. McGregor and her sister Pamela Esposito-Amery in 2009. The Brooklyn based grassroots foundation that started by working out of a home office and has grown since then and has raised over a million dollars benefiting Ovarian Cancer research and awareness programs through the annual T.E.A.L.® Walk/Run Program and other events and programs throughout the year. The T.E.A.L.® Walk/Run, however, is just one of the many programs where Tell Every Amazing Lady® About Ovarian Cancer promotes awareness and raises funds for research. Throughout the year, T.E.A.L.® is constantly reaching the public by hosting fundraisers and spreading awareness and education in the community at health fairs, hospitals, symposiums, and schools. Contact Us at info@tealwalk.org about Organizing a T.E.A.L.® Walk or Run in your area!